August is when everyone in Nova Scotia wants to go on vacation. The weather is almost guaranteed to be hot and sunny. Daily highs average around 23°C but a heat wave can easily take temperatures above 30°C. Like in July, beaches are very busy. August is the sunniest month along the coast. 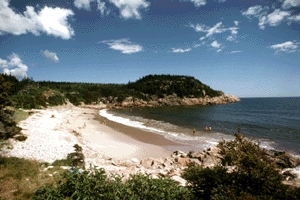 National parks like Kejimkujik in the Annapolis Valley and the Cape Breton Highlands on the Cabot Trail are also popular August getaways for camping, hiking, swimming and kayaking. One of the best festivals in August to experience is the International Busker Festival in Halifax. Also check out the Folk Harbour Festival in Lunenburg and in Digby there’s the Scallop Days Festival. You’ll want to make reservations for nearly everything, including hotels, campgrounds and car ferries. This is particularly true on Natal Day. It falls on the first Monday in August and makes a long weekend for many Nova Scotians. There are big Natal Day celebrations in Halifax.